PHOTO: Allen Ramsey, DWCPhoto.com. 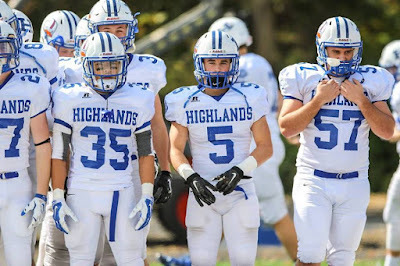 Highlands seniors Taylor Perez (35), Conner Welsch (5) and Elijah Miller-Cox (57) get ready to take the field Saturday at Covington Catholic. Jared Dougherty has given the Highlands Bluebirds football team consistency in its kicking game the past couple seasons. The senior finds himself at the top of the Highlands record books with 176 career made extra-point kicks. He hit his 171st point-after touchdown against Dixie Heights last week to break 2000 graduate Brennan Jones' Highlands and Northern Kentucky record of 170. Dougherty said he began kicking when he was young with his dad Jack. He's helped Highlands to two state championships and a runner-up finish while in high school. "From a little kid with my dad, it always builds up (once) you find something you're great at," Dougherty said. "I didn't know about it until a week ago when my sister (Brooke) was telling me about it. It's a pretty good thing to be able to do that." Dougherty nearly broke the single-season PAT record his sophomore year. Dougherty hit 89 PATs in 2013. Jones still holds that record making 90 during the 1998 team's undefeated Class AAA state championship run. Dougherty finds himself 12th on Kentucky's all-time list in career PATs and the 2013 season total ranks sixth in state history. Dougherty is three PATs away from taking over 11th place all-time on the career list. Former Anderson County kicker Bill Rose made 178 in his career. Two people own the state record for most PATs in a season. They are former Scott County kicker Palmer Ward and Lone Oak alum Jack Coorts with 297 each. Ward also owns the season record making 102 in 2013. Dougherty accomplished a rare feat at Highlands stepping onto the field as a freshman in 2012 and doing the kickoffs. He took over the punting and placekicking duties as a sophomore. On the field, Dougherty played running back as a sophomore before moving to linebacker as a junior. "When I was freshman, it was a little nerve-racking," Dougherty said. "I remember my first kickoff against Boyle County, I only got it to the 20-yard line. I couldn't get it anywhere else after that. It helped build my confidence for not only kicking, but coming out here in a game like this." Dougherty did miss two field-goal attempts against Covington Catholic. But he hit three against Dixie Heights. "You need to have a short memory," Dougherty said. "If you miss one, you have to let it go. You have to make one after that. It's about confidence." The Bluebirds improved to 48-17 against the Colonels all-time with their 14th straight win in the series. Highlands has beaten Covington Catholic during the regular season and the playoffs in each of the past four seasons. The teams could again see each other in the Class 5A, Region 3 title game. If that happens, Highlands could again find itself trying not to suffer the fate of the 1997 and 2001 squads who beat Covington Catholic during the regular season, but lost to the Colonels in the playoffs. CovCath went on to win the Class AAA title after that win in 1997. For the ninth straight year, Highlands (3-5 overall, 2-0 district) will enter the playoffs as the top seed. The Bluebirds hope to wrap up their ninth straight unblemished district championship against Grant County on Friday. The Bluebirds have won 28 straight district game dating back to their last loss to the Colonels in 2006. That leaves Covington Catholic (2-6) and Dixie Heights (2-6) battling for the second seed in District 5 on Friday with 1-1 records in district play. Dixie Heights held off Grant County, 28-20 in Dry Ridge on Friday. Grant County will have the fourth seed in the district. The Braves (3-5 overall, 0-2 district) will be making their first playoff appearance since 2008 and two more wins than each of the past two seasons despite that. In terms of the region, Madison Southern (3-4, 2-0) is in the driver's seat for the District 6 crown. Anderson County (4-4) and Montgomery County (5-3) have 1-1 district records and Woodford County (3-5) is 0-2 in district play. The Bluebirds will be favored to finish the regular season with a .500 record of 5-5 with the last two games against Grant County and the Boone County Rebels (0-8). The Rebels face Campbell County on Friday. One team will earn its first win of the season. The North Laurel Jaguars wrapped up the undefeated District 8 crown with a 37-14 win at Perry County Central on Friday. The Jaguars (9-0) have next week off before finishing the season against Montgomery County in London. A win would leave the Jaguars as the only team to finish the regular season unbeaten in the class. In terms of the playoffs, though, the Jaguars happen to be in the same Region 4 with Pulaski County and Southwestern. Both are 7-1 overall and 2-0 in District 7 action. The squads face off for the district championship Friday. The Bowling Green Purples will also battle an in-county rival in Greenwood for the District 2 championship. Both teams are also 7-1. Louisville Fern Creek (8-1) has wrapped up the District 4 title. But North Bullitt (8-1) and South Oldham (7-1) will face off for the District 3 crown on Friday. The Highlands junior varsity team is 5-2 with a 22-0 blanking of Dixie Heights on Oct. 10. The Bluebirds take on Covington Catholic on Monday at 6 p.m. in Fort Thomas.